From our humble beginnings back in 1988 we have gained a wealth of experience in sourcing and importing quality timber. The timber used in the manufacture of our garden buildings is Scots Pine (Pinus Sylvestris), a quality redwood slowly grown all over Northern Europe. We source all our timber from a swedish sawmill that was founded in 1912, with over 100 years experience in processing timber their products are 1st class. This sawmill is fully PEFC certified and uses trees cut from its own and neighbouring forests within a 25km radius of the mill itself. All trees are replaced with a new sapling making sure there is a never ending supply of quality raw material. Our close working relationship ensures a constant supply of 1st grade claddings and framework, this can only be achieved by working closely with a supplier that is in full control of the whole milling process. 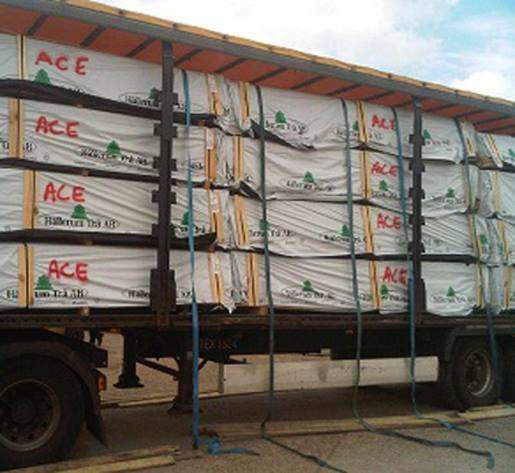 All timber is delivered to us direct from sweden on a 70cu3 trailer. This ensures multiple handling and long storage on docks is eliminated which in turn keeps the timber in 1st class condition.